The baby girls, Marion Loretta Elwell Broderick and Tabitha Hodge Broderick, were born last Monday at an Ohio hospital to a surrogate mother. 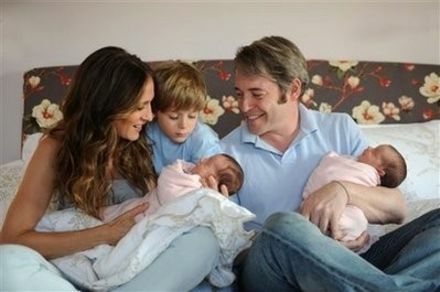 The photo, taken Monday in New York, shows a happy family: Parker and Broderick are smiling, each holding a twin. Their 6-year-old son, James Wilkie Broderick, stands in between mom and dad, gazing down at one of his little sisters. Anyone else with twins or a multile birth? The discount code TWINSAVE will save 10% at our checkout.